Makeup can easily become bathroom counter clutter that takes up needed space. Beauty products and makeup usually end up being an area where we have multiples of the same product to have a spare or to keep a “maybe later” for a different color or new brand. To really keep the clutter to a minimum, you’ll need to toss out or give away those products that have not been used in a long time. A silverware divider is a great organizational tool to keep your products in one place either on the counter or in a drawer if your vanity has one. 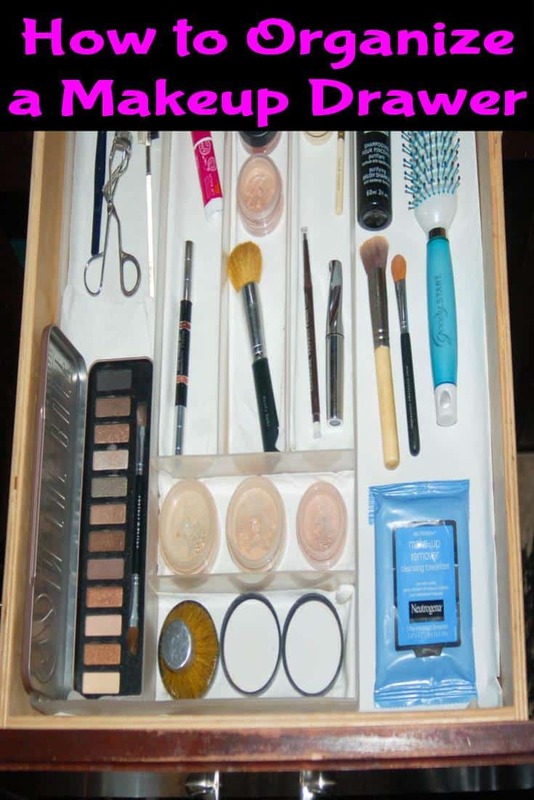 A divider is especially helpful if you use makeup like Bare Escentuals with multiple containers and lids. You can save time by keeping the lids off and save money by not losing powder from moving them around or dropping them. The rest of the products are a mix of things that I like and they are placed around the divider in the order that I put them on. This system saves time and helps to keep everything in its place so it’s an “auto-pilot” way of getting ready! I line the bottom of the drawer with a piece of butcher paper (a design liner paper would look better but this drawer quickly becomes a mess and I’d rather just trash the cheap paper when I clean it out). I also put paper towels in each divider section because of the mess that makeup (or messy me) creates. This simple system has worked out great to organize and speed up my time getting ready; hopefully it has given you some makeup drawer organization ideas too!